Students gather on the balcony of the Guest House on Keystone campus. I think we are in a new world, knowing and gaining knowledge. This week we had an excellent topic: “Governance.” At first, I was wondering about what we would study. I had no idea about what to expect. As usual, we started our classes with a CBE (Crossing-Boundaries Exercise). The weather was good this week and warmer in general. We had K.C. Malhotra’s lecture and within an hour we learnt so many things. 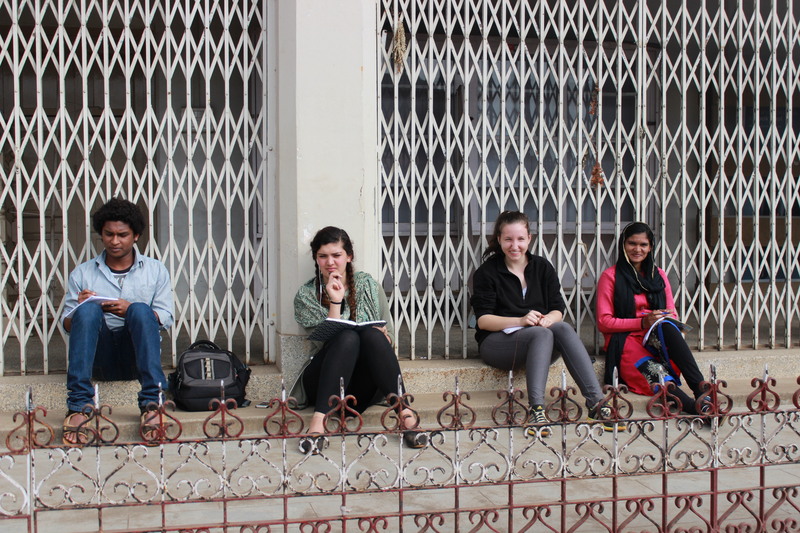 Subin, Asja, Rachel, and Thulasi sit and observe the world around them during the Bus Stop Exercise. On the first day we did a “bus stop” exercise. It was really good. 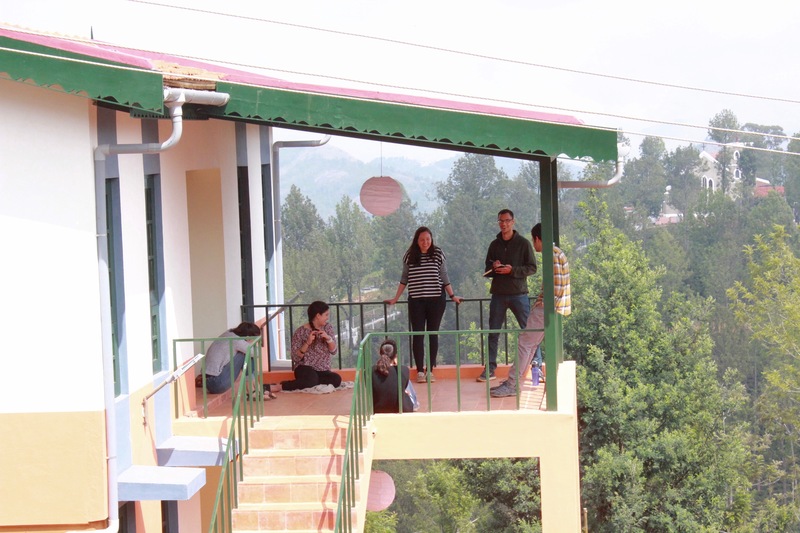 We observed each and every moment of the public and a particular area of Kotagiri. My group was at Ramchand. There I observed a very caring brother. Two young school boys were crossing the road. The older boy was carrying the younger brother’s bag, holding his hands and carefully crossing the road. I liked the session in which we were all asked to share our bus stop experiences. 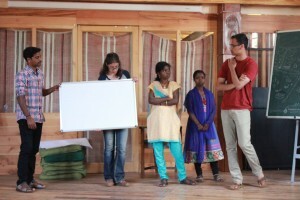 Then there was another guest lecturer named Kavitha. She spoke about legislature. We also discussed how government works — from the counselor to the state executive. 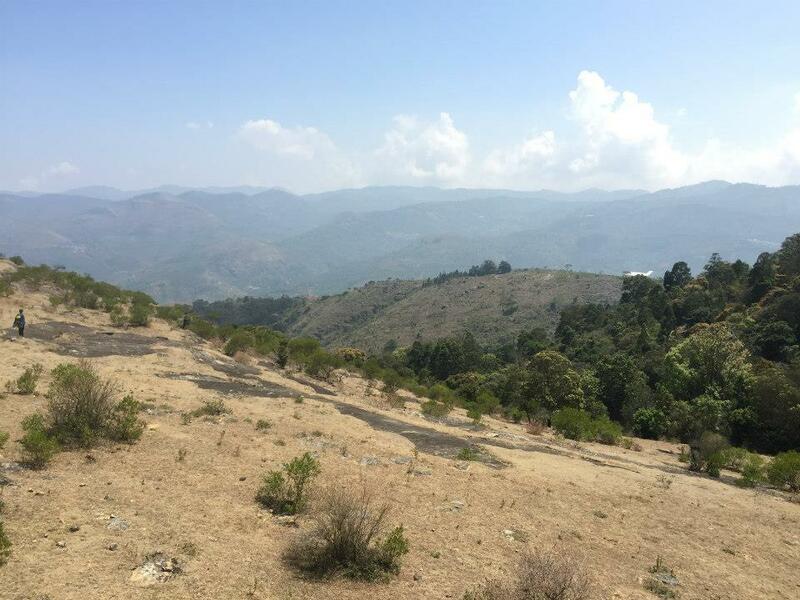 We started our journey to Coimbatore at 8:30 AM on Wednesday. There we met some of the Keystone staff who work on urbanization and sanitation. We met them at the Coimbatore Keystone office. Then we met some government officers who were working on urban governance. They told us about how they were planning to make Coimbatore a “smart city.” It was interesting to know their plans. 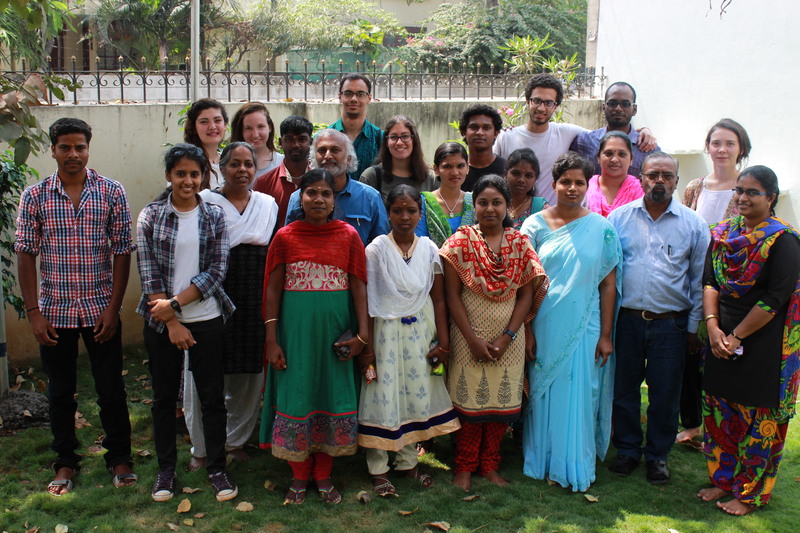 The group assembles for a photo on the NFLC’s visit to nearby Coimbatore. Then we went to the shopping mall. We watched a movie called “Visaranai” which was different from the movies I have seen before. That movie was about governance, politicians and police. I enjoyed watching the movie. The next day K.C. Malhotra held his class from 10:30 AM to 1:00 PM; it was a long class but I liked it. I knew many abbreviations such as BMC (biodiversity management committee), IPR, CBD etc. We also acted out a drama. I enjoyed acting it out. It was based on governance in a city. We created an imaginary story. On Friday, we did a survey on how the public thinks they can bring better governance in their area. From 10:00 AM to 1:00 PM we did the survey. 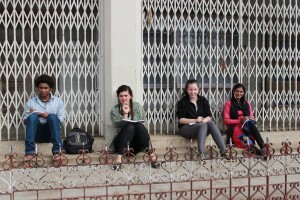 We were divided into three groups, my group went to Ramchand, the market, the bus stand and Johnstone square. We interviewed 25 people. At the beginning, it was difficult to ask people about governance. We didn’t get the answers that we expected. Gradually we understood what and how to ask the questions. Mani, Jackie, Indurani, Banti, & Rabin make a presentation in Manda Arae. The governance week ended with each group doing a presentation on what they surveyed. In our survey, people complained about pollution. Each individual should think and start cleaning from their house level. I felt very happy this week to know that people are working in very big and hard positions in our government.